Welcome to community of Columbus Grove! This gorgeous 3 bed, 2.5 bath with 1,808 sq. 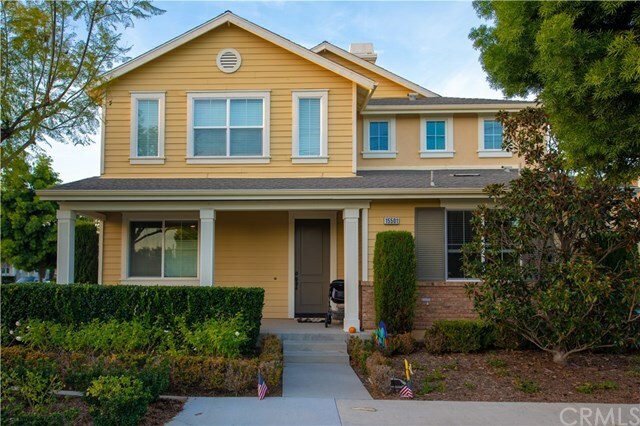 ft. of living space is located in the prestigious Irvine Unified School District which ranks among the top school districts in Irvine! This is a corner lot and face to the community open area and playground.Open living room is surrounded by large windows and recessed lighting. Gourmet entertainers kitchen features granite counter tops, generous white cabinets throughout and General Electric stainless steel refrigerator, stove, dish washer and microwave. Spacious master bedroom has a beautiful restroom that features dual sinks, large soaking tub, separate shower, private toilet and two walk in closets! Property has direct access to the two car garage. Beneath the staircase you will also find an abundant additional storage area. Resort style amenities include private gated pools, spas, children's pool, playgrounds, basketball courts, green belts, private club house and outdoor workout equipment that lines the biking/hiking trails. Location, location, location, close to the 5, 405 and 261 toll road this home is in the heart of Central Orange County! From here you can easily access John Wayne Airport, The Market Place, The District, an array of fine dining, shopping, entertainment destinations and of course Costco! This property will not last long in this high demand area! Directions: Harvard to Columbus grove.property is on the left side.